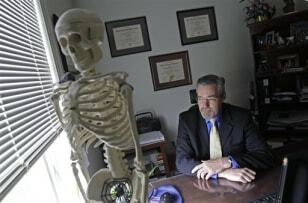 Dr. A. Clark Gaither is seen at his family medical practice office in Goldsboro, N.C.. Reporting a problem doctor can trigger important changes. Twenty-one years ago, a colleague smelled alcohol on Gaither's breath and anonymously reported him to the head of the residency program. The now-sober Dr. Gaither is grateful.